Join us at the Fireplace Pavilion at Fisher River Park in Dobson for our annual picnic. This year we will be having bbq chicken and hotdogs. The club will provide everything but sides. Plan on eating around 5:00 pm. If you plan on attending please leave us a comment on our Facebook page at https://www.facebook.com/SurryCountyBeekeepers/ to let us know and how many are going to be coming with you. If you plan on bring a side please leave that in you comment as well. For those of you that signed up at our last meeting please don’t comment we don’t want to count you twice. We look forward to seeing everyone at the park. Experience the scenic mountains of North Carolina! 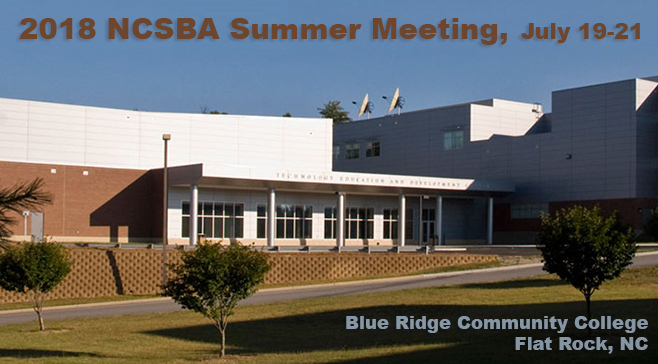 Make plans now to join your fellow beekeepers for the summer meeting to be held at a spacious and beautiful, green space venue in the Blue Ridge Mountains near Flat Rock, Hendersonville and Asheville. Experience three days of excellent beekeeping presenters, participate in informative workshops, meet and shop with the major purveyors of beekeeping equipment and supplies, and enjoy the company of old friends and make new ones. Tom Seeley- Cornell University- Author of Honeybee Ecology (1985), The Wisdom of the Hive (1996), and Honeybee Democracy (2010). Dr. Seeley’s research focus is the social behavior of the honey bee. David Tarpy- NCSU- Outstanding professor and researcher, NCSU Cooperative Extension State Apiculturist. Dr. Tarpy will present on his current research at NCSU and beekeeping issues in NC. 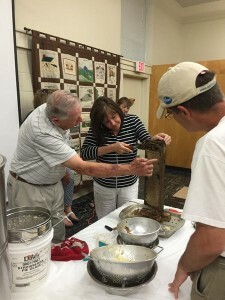 The Master Beekeeper Program Committee is offering Testing at the Summer Meeting being held at Blue Ridge Community College in Flat Rock, NC. Testing is available to all active NCSBA members and will include Certified, Journeyman and Master Beekeeper levels. Thursday morning, July 19, from 10:00 am till noon, a “Journeyman to Master Beekeepers Review” will be held in the Sink Building, Thomas Auditorium. All members are welcome to attend. Also on Thurdsay moring at the same time as above, an “Ask the Experts” program will be offered to allow NCSBA members to get answers to questions from experienced Beekeepers, State Apriary Inspectors and Extension agents. 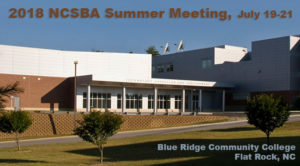 This program will be held in the Blue Ridge Conference Hall. MBP testing will begin on Friday afternoon, July 20, from 1:00 to 4:00 pm, with no written test handed out after 2:00 pm. MBP testing will continue on Saturday morning, July 21, from 9:00 till noon, with no written test handed out after 10:00 am. We encourage all members who are interested in testing their knowledge of beekeeping to participate. If you have any question, contact an MBP Committee member. The NCSBA website has an extensive amount of information about the Master Beekeeper Program and is a good place to start if you are interested in the program.